Today I have a blitz of chair makeovers...to remind us all that a dingy old piece can have a fantastic new life if you give reupholstery a chance. Just lovely...and especially so, paired with the golden stool and layered rugs. Take note that neither Rae nor Jaime tackled the upholstery jobs themselves. Don't forget that there is a whole workforce of skilled upholsterers out there just waiting to do these jobs for you. I think we get overwhelmed thinking that these kind of re-dos are DIY jobs...you'll find that although reupholstery is not cheap, it often yields a much better, custom result than buying furniture new. And (usually) still at a fraction of the price. 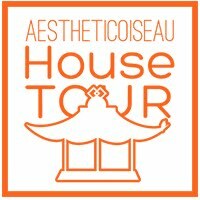 Not to mention that most vintage pieces are very well-built and thus will stand the test of time in your home. Do a little research and get some price quotes in your area. I bet you will find someone whose pricing is reasonable and whose work is fantastic. 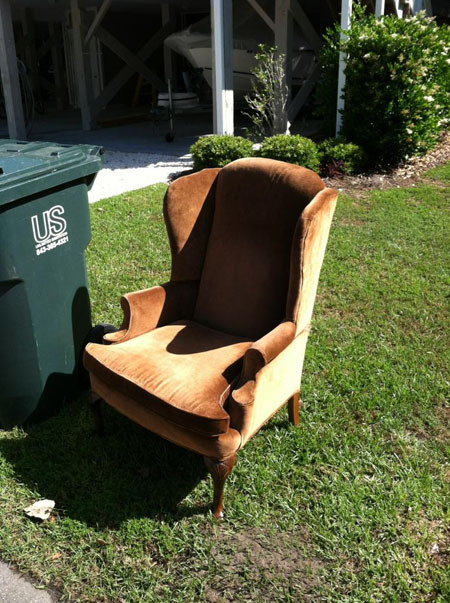 This post must be a sign for me....I went digging in our storage space yesterday, and fished out a chair that looks almost EXACTLY like the one in the first pic. Ripped out cane back, terrible seat, etc. I told my husband it was also loose/unstable in one of the joints, so I was going to give it away. Definitely having second thoughts now! I am so jealous of Jaime's find! I have been looking for a pair of tub chairs forever. As for dumpster diving, as much as I would love to score a free deal like that, the proliferation of bedbugs has me totally freaked out about the idea. A friend of a friend got bedbugs from a weekend trip to a 5 star hotel in NYC. He soon found out that the "romantic getaway" with his wife was turning into a $4,000 extermination project. 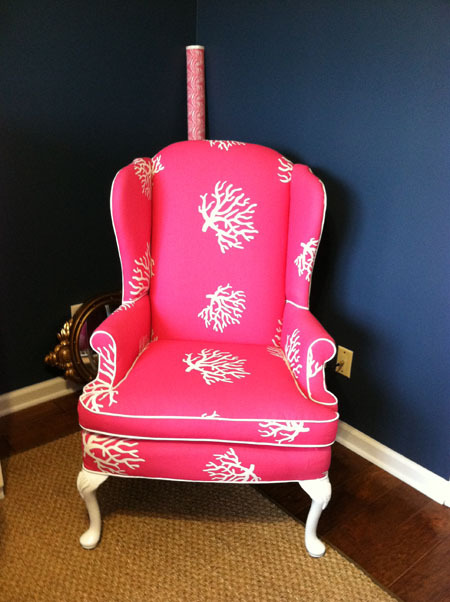 I LOOOOVE all these chair makeovers! Before I worked in the interior design industry, I didn't realize that there are upholsterers who know how to do these jobs. It's such a fun way to make a customized piece! These are GREAT. And you're right about the prospect of a DIY being daunting--no shame in hiring a professional! 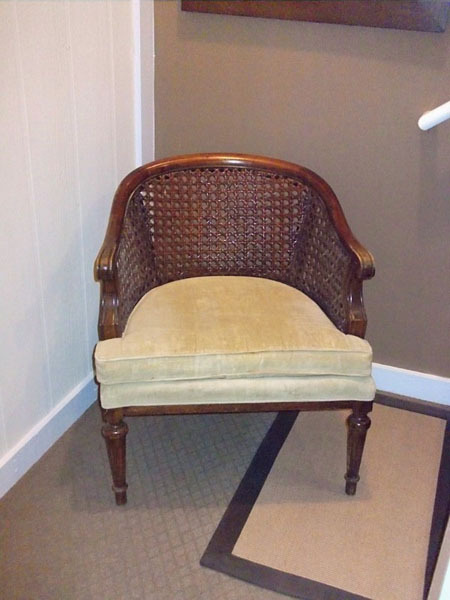 Applause for the cane back tub chairs!! I'm gonna go check craigslist in my city...just in case! Can Jaime share the name of the textured green fabric and where she bought it? Thanks so much. The contrast piping is gorgeous. I love them all. I had a 1970s orange flowered, thrift store sofa redone in a gray fabric last year as well as two vintage chairs. They are so much more pleasing (and cheaper) than the hundreds of high end stuff we looked at. I am just itching to have others redone or start dumpster diving for fresh meat. Amazing makeovers!! Plus several of the chairs need very little yardage. Love the hot pink trim against the green! I need to start Craig's List searching! Love this post! Gosh . . .lovely fabric and a little TLC makes such a difference! Talk about vision. These pieces look fabulous. I especially like the last one. What a transformation! 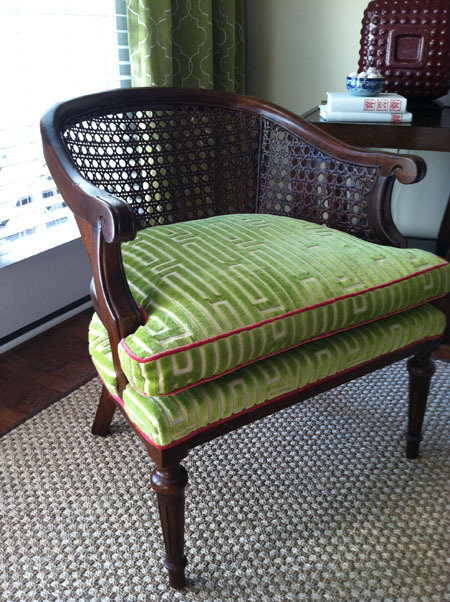 Just goes to show you what a little creativity, design sense and the right upholsterer can do! Absolutely love that middle one! Where can I find the pnk coral fabric? Love it! !